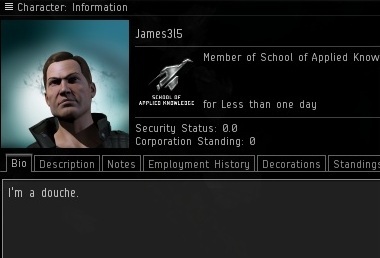 The rise of my power and influence in EVE has been, like so many other things, accompanied by certain side effects. 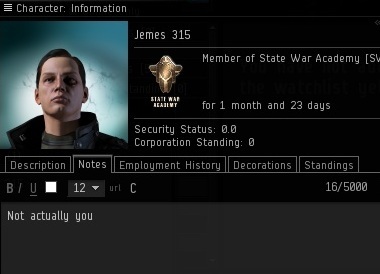 I was contacted by one of my spies, who brought word of an imposter in Kino. As always, having many extra sets of eyes and ears around highsec proved useful. A lot of rebellious miners would be surprised how many supporters of the New Order are mining in their very midst! 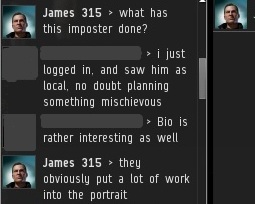 The imposter, James3l5, used no space between "James" and "315", and used a lower-case "L" instead of a "1". The portrait is a decent--but far from perfect--copy of my likeness. (For a comparison, see my autographed portrait on the three month anniversary post or my portrait on the About page.) And, of course, the bio is a dead giveaway. I would never call myself a "douche", as that would be incredibly misleading. The result, Jemes 315, was an even less convincing imitation. How can we explain this phenomenon? Maybe it's all the Russian-themed posts of late, but I am reminded of the False Dmitriy. 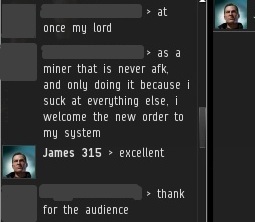 The miners covet my power and authority. After all, who would impersonate someone with no power?